"These are great for keeping food warm. I primarily use these for steaks but you can include veggies, potatos, and the like right along side. 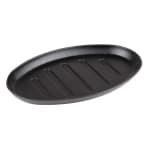 Co..."
"Did not know the Handle and Wood Holders were NOT INCLUDED on my order 0f 8 platters." "These are great for keeping food warm. I primarily use these for steaks but you can include veggies, potatos, and the like right along side. Couple these with available wooden trivets and cast iron removable handles and they're not only highly functional but a great conversation piece for your guests to admire."